Corona and Modelo beer brewer Constellation Brands Inc (STZ.N) said it will buy San Diego-based craft beer maker Ballast Point Brewing & Spirits for about $1 billion to compete in the fast-growing craft beer market. A billion here and a billion there and pretty soon you're talking real money. Some quickie comments as the news comes in. Ballast Point is one of the strongest brands in the US. There aren't a ton of top tier brands out there, so it makes sense that Constellation paid premium dollars for it. All of which leads me to this last point, which is one I think most people haven't fully digested yet. Big beer companies are betting on the steep decline of mass market lagers in the US. I constantly get asked whether we're in a bubble or not, and this should be gold-plated proof: we're not. A permanent upheaval has begun in the beer market, as mass market lagers get replaced by what we formerly called craft beer. Whomever can hoover up market share on the full-flavored ales and lagers will be the big winner in the marketplace of 2030. And if you don't believe me, believe AB InBev, Heineken, MillerCoors, and now Constellation, who are paying way, way more for breweries than their absolute 2015 value. The reason is because they're betting on the future, and they're betting on "craft." Update. I elaborate on this post at All About Beer: "Betting a Billion Dollars Against a Bubble." 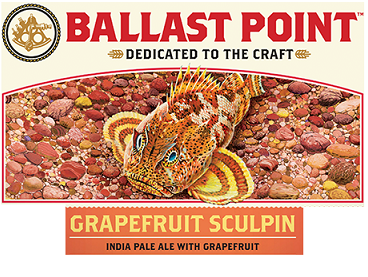 Will we see more product placement for Ballast Point? Their bottles have joined SNPA on The Big Bang Theory. You've only looked at their beer in terms of that huge valuation here Jeff - surely their spirits and pre-made cocktails would have had an impact on this too? Matthew, it's a good observation. I did basically ignore that dimension because I just can't imagine that portfolio adds much value--certainly that much value (at least 2x). But it is worth acknowledging. I disagree about the bubble comment; this smacks of the investment/IPO/money of the tech bubble way back when, when big companies were paying stupid amounts of cash for small tech wunderkinds; I don't think $1B is, frankly, realistic. Can't disagree with your core tenet about the decline of mass market lager though. That's been apparent for a while now. Jon, I think one major difference between the tech bubble and beer is that there is actual product being produced, with actual value. Not just theoretical. A lot of the tech industry was based on ideas that were either unproven in the market, or simply didn't exist. I think of this in a different way, that this itself is the bursting of the bubble. The bubble being burst is the one defined by the BA, the idea that craft brewers value independence, the myth that there is anything about the industry that is small. uh-oh if Ballast point is worth this what is Deschutes worth $7 Billion? Even Gary Fish has to be tempted at that amount. Interesting stuff. It certainly makes you sit up and think when you hear that magic 1 billion figure. It's crazy money based on real world value so they must have seen the writing on the wall for their current mass market brands. I'd like to think they are right, anyway. Anon, yes there is a difference in tech and beer but I would also point back to the brewing bubble of the 90s when lots of money was being thrown around for craft beer then, and that didn't end well for the market. Same thing for beer as in tech, throwing ridiculous amounts of money at companies is not a tenable strategy nor sustainable. Jeff, interesting stuff as always. I'd offer the opinion that Big Beer (In-bev, constellation, etc), are not betting on craft beer as we understand it...namely a diverse landscape of lots of small, handcraft flavorful beers. Rather, they are betting on the growth of a few brands with craft perception and flavors. The other side of the coin, in my opinion, is that they are buying these brands to employ pricing and distribution strategies that ultimately kill many small brands and result in a less diverse ecosystem. Alan, a clever re-frame on the "bubble" concept. Dunn, nice--thanks. That settles that question. Anon, you could be right. But again, it really depends on how you answer that question I posed to Jon above. You're killing the golden goose if you fail to anticipate a massive market shift toward craft in the next decade. Looking forward to that AAB piece. I agree that it may not add much value now but it may well do in the not too distant future. If those pre-made cocktails taste as good as they look then they'll no doubt be huge - especially with the marketing and distribution leverage that Constellation will be able to put behind them. Be interesting to see how things pan out here in the UK - BrewDog began importing BP bottles and cans a few months ago and they've been a huge success despite being pretty pricey. James Watt was recently quoted in print as saying Grapefruit Sculpin is 'his go to beer for any situation' - However when Lagunitas sold 50% to Heineken he publicly severed ties, going on record to say that his bars would no longer be stocking any Lagunitas product. Different strokes, I guess.